Of course it all depends on how you define “smart.” If it’s 1996, it means some very basic internet (what else was there?) plus room for 200 contacts, a clock, a calendar and a fax program. (Yeah, that’s right! FAX!) That’s what you got with this Nokia 9000-series communicator. Even for its day it was a behemoth, about the same size and weight as a 20 ounce beer can. But it was the dawn of a new age and without it, the world of today’s smartphones might not even exist. Opening the phone up made the hinged antenna look a little less dorky, too. What a dream device this was for the young mobile professional back in the days of the Macarena. At that time, just having a cell phone at all made you one of the elite, but imagine having one device that could actually store your calendar entries, your phone book, let you send a letter (via FAX!) and even check out a web page (presumably at a very very slow speed.) This little device did almost everything a secretary could do, and that was a valuable and exotic idea back in the 1990s. 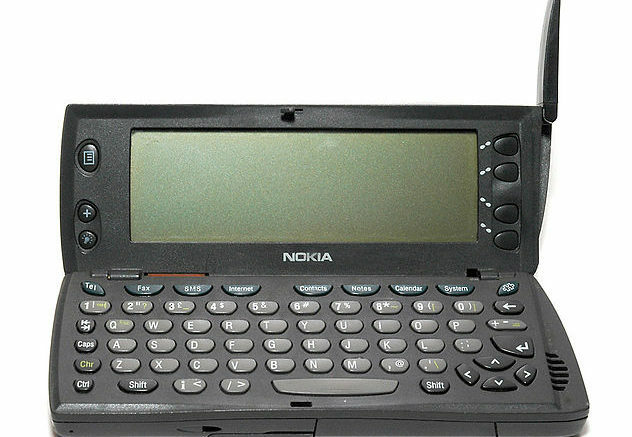 Nokia didn’t sell a lot of these, considering they cost about $800 a pop and cell minutes were still expensive back then. But it was a good proof-of-concept and Nokia continued to develop the line until they were close to the size of an iPhone. Sadly though they were eclipsed by later generations of phones from Palm, Apple, and eventually Google, but it all started here. One last thing… before you complain about its size it was still smaller than a Galaxy Note.